The tightly knit ethnic neighborhoods that defined New York City in the 1930's and 1940's produced two men - Nathan Glazer (top photo) and Daniel Patrick Moynihan (bottom photo) - who would start a national discourse on cultural pluralism in the United States with the publication of Beyond the Melting Pot (1963), a study of ethnic life in New York. Glazer, the son of Jewish immigrants from Poland, grew up in the tenements of East Harlem and the Bronx. Periods of poverty landed Moynihan, a third-generation Irish-American, his mother and siblings in Manhattan slums with occasional breaks in suburbs and rural areas. Both men held positions in the Kennedy administration. Glazer served as an urban sociologist for one year ending in 1963 in what is now the U.S. Department of Housing and Development. An assistant secretary of labor until 1965, Moynihan served on a task force that drew up antipoverty legislation, including an employment program. After Kennedy's assassination, President Johnson declared the War on Poverty, but Moynihan's ideas for a job creation program were ignored. Moynihan's differences with the Johnson administration led to his dismissal soon after the election. Many of the War on Poverty programs foundered, and both Glazer and Moynihan became frustrated with the government's unwillingness to address poverty at the family level. Beyond the Melting Pot was "one of the most popular, and most influential, works of sociology of its time," wrote James Traub in a 1998 profile of Glazer in the New York Times Magazine. The book generated a debate as to whether-and to what degree-ethnic cultures should assimilate into American society. The authors found that America had not become a melting pot from which a single nationality would emerge-a concept long accepted as a natural course. Instead, they showed that each group maintained its ethnic character with successive generations as a result of history, family structure, skills, and culture. At the same time, according to the authors, some of these forces, especially an unstable family life, contributed to a group's difficulties. In the end, each ethnic group recreated their identity as a result of their experiences in the U.S. yet adopted American culture. Ethnicity would diminish slowly, the authors suggested, with the rise of a religious identity. 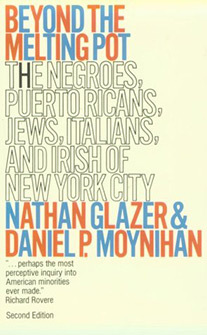 With the publication of the book's second edition ten years later, Moynihan and Glazer noted that their optimism was premature and that assimilation had not been quick for African Americans and Puerto Ricans. Glazer and Moynihan continue to examine these and many other social issues in their fields. They are co-editors of Ethnicity: Theory and Experience (1975) and have each written numerous books and articles. Glazer is a professor emeritus at Harvard University. The experiences of African Americans, which have been unlike those of other ethnic groups in the U.S., present a conundrum for Glazer, who has reconsidered some of his early work. In his most recent book, We Are All Multiculturalists Now (1997), he sets aside his hopes for assimilation. Moynihan has dedicated his career to work and family issues, whether as a professor or a public servant. He is the only American in history to serve in four successive Presidential administrations. He was a U.S. ambassador to India and the United Nations. A senior U.S. Senator from New York for 24 years, Moynihan retires when his term ends in 2001. He was the 1998 recipient of the Heinz Award in Public Policy for "having been a distinct and unique voice in this century -- independent in his convictions, a scholar, teacher, statesman and politician, skilled in the art of the possible."